Summary: Azalea is trapped. Just when she should feel that everything is before her . . . beautiful gowns, dashing suitors, balls filled with dancing . . . it's taken away. All of it. My review: Many book summaries can give away too much of the story, others can merely tease, alerting my brain's curiosity button. Then there are some which draw me to them for their covers. Entwined is one of those titles. The cover is gorgeous with its soft colors, an outdoor shot, the model running to something or away from (depending upon your viewpoint). When I began reading the story I was actually happy I was sick that day. I spent the entire time lost in Heather Dixon's world. I also have to say the summary is just a hint of what the story is really about. The eldest of twelve sisters, a promise to her dying mother to take care of her siblings, an old castle once full of magic now sitting quiet and unused, secret panels on brick walls and an evil dead king bent on returning to his castle and revenge. Entwined is an old fashioned fantasy filled with dancing, mystery, adventure, young love, and the desire of a daughter to make her grieving father, the King, happy once more. This year has begun with some fantastic titles I have loved and this book is on my list. 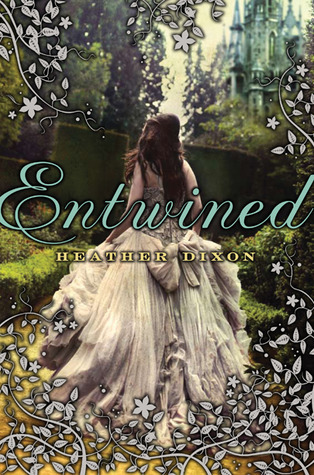 Entwined has what good fantasies usually have: a lot of pages to get lost in (480), an enchanting world with an even more mysterious and creepy sub-world, lots of magic and magical items, a heroine determined to do the right thing, a young man to swoon over, adorable sisters, a bunch of funny suitors, a promise to a deceased mother, a mystery to solve and dancing. Lots of dancing. Our heroine, Azalea (all sisters are named after flowers) is the oldest and she discovers a secret wall and passage. Thinking her siblings asleep, she investigates and finds a shocking silver world and a building where a dance is being held. She loves to dance and watches the costumed folk swirl and twirl around. When a handsome man approaches her and asks her to dance, Azalea accepts. And from then on her life will never be the same. This man holding her in his arms is The Keeper and as his name implies, he desires to keep Azalea. And more. Cue creepy, mysterious music (jewelry box music would fit in wonderfully here). This is one story I don't want to heavily detail in my review. Entwined has to be experienced. Dixon certainly can pen scenes and believable characters. The family dynamics, the supernatural world, the action scenes and the dance passages really hold this tale together. I was sucked into Azalea's world and smiled when it had to end. 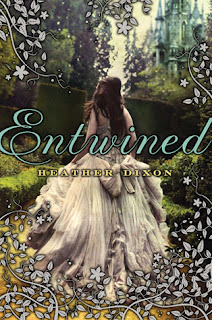 If fantasies are your favorite types of stories, Entwined should be on your list. Favorite excerpt: From page 355, ARC. "He was shockingly easy to follow. The pressure of his hand, the step of his foot, the angle of his frame. . . it was like reading his mind. When he leaned right, they turned in perfect unison. He swept her across the gallery in a quick three, a dizzying pace. Gilded frames and glass cases and the window blurred in her vision, and Azalea spun out, her skirts pulling and poofing around her, before he caught her and brought her back into dance position. She could almost hear music playing, swelling inside of her. Mother had once told her about this perfect twining into one. She called it interweave, and said it was hard to do, for it took the perfect matching of the partners' strengths to overshadow each other's weaknesses, meshing into one glorious dance. Azalea felt the giddiness of being locked in not a pairing, but a dance. So starkly different than dancing with Keeper. Never that horrid feeling that she owed him something; no holding her breath, wishing for the dance to end. Now, spinning from Mr. Bradford's hand, her eyes closed, spinning back and feeling him catch her, she felt the thrill of the dance, of being matched, flow through her. "Heavens, you're good!" said Azalea, breathless. "You're stupendous," said Mr. Bradford, just as breathless. "It's like dancing with a top!" Cover comment: There has been a tendency with YA book covers to place a model in a beautiful gown or dress lately. Sometimes I wonder why, especially if the main character NEVER wears something like on the cover anyway. But with this book the pretty dress fits. Azalea does wear lovely dresses so thanks to the Art Department for being true to the story. You had me at creepy music. I've got to get my hands on this! I love a good fantasy that has a dark feel to it. After that review I am totally looking into this book!! Thanks so much for tempting me with this book I haven't seen it around so seeing it for the first time on your blog. You had me at the Jewelery box music he he he!! I'm reading this book right now and I love it so far.